Three days after our wedding, my new husband Johnny Jet and I departed my hometown of Toronto for our dream honeymoon. We flew out of Toronto on Korean Air, headed first to Seoul and then on to the ultimate honeymoon destination, Bali! Before leaving for the airport, I went through my usual pre-flight routine. Toothbrush, passport, laptop? Check, check, check. I ran through my list of essentials and was all set except for one last thing. 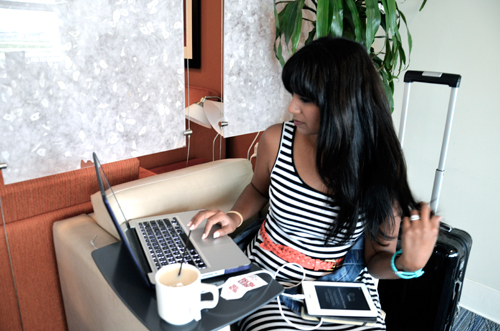 I can’t travel without my Kobo but I’d not had time to download any new books. With just half an hour to go before we left for the airport, I downloaded two new novels: Andrew McCarthy’s memoir The Longest Way Home (Free Press, 2012) and a thriller by Linwood Barclay, Never Look Away (Delacorte Press, 2010). I waited impatiently for the books to download but once they did, my Kobo froze. What? I didn’t have time for this. I started to panic. A bookworm like me can’t go two weeks without her books. I went online to troubleshoot but nothing I tried revived my e-reader. We made a pit stop at Walmart to grab a new one before heading to the airport. As we walked through the international departures terminal at Toronto’s Pearson airport, John told me I had a number of surprises awaiting me throughout the course of our honeymoon. Surprises? Who doesn’t love surprises? I’d have to wait to discover what he had in store for me! We checked in for our flight, went through security, then waited in the lounge until our flight was ready to depart. 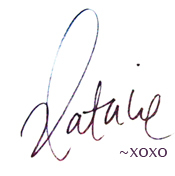 My new Kobo was not formatted; I had to download all my books on there before I could use it. Fortunately, Pearson International Airport has free WiFi so I jumped online immediately to get my Kobo up and running for the 13-hour flight. But it took so long to format and download my 50+ books, it didn’t finish before I had to board the plane. Ugh. A 13-hour flight with no books. Not good. Turns out I didn’t really need to worry about that. Love the free WiFi at Toronto’s Pearson International Airport. Trying to format my Kobo and download my books before boarding our 13-hour Korean Air flight to Seoul. As we boarded our Korean Air flight and walked to the very front of the cabin, I realized that we would be flying first class … what an amazing surprise! The seats were huge with tons of legroom. And the first class cabin was virtually empty, making us feel like we were in our own private living room. 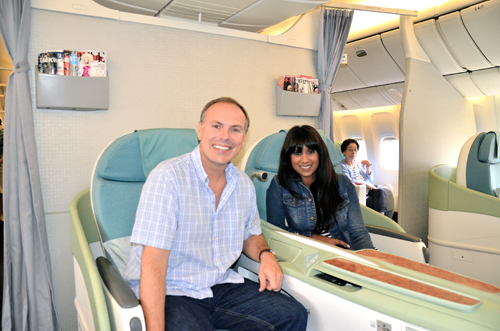 First-class seats on our Korean Air flight were an amazing surprise and made the 13-hour flight a breeze. 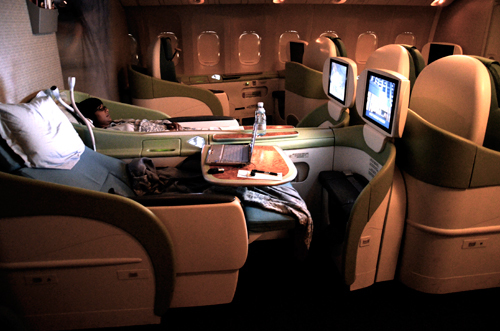 When it’s time to sleep, those big, comfy seats lie fully flat. I’ve had the good fortune of traveling business class on other airlines with lie-flat seats but Korean Air’s seats are probably the most comfortable I’ve ever experienced. I was truly comfortable, not just sort of comfortable. I woke up feeling like I’d had a great night’s sleep, which doesn’t happen often on an airplane. And thanks to the incredible entertainment system, I didn’t even miss my Kobo. The selection of movies and television shows is extensive (I finally got to watch Snow White and the Huntsman), as well as the selection of music, kids’ channels and games. The entertainment system offerings are the same in all classes on Korean Air but the screens get larger as you move from economy to business to first. You can even access the in-flight duty free shopping from your individual screen. Kobo? What Kobo? Yeah, I didn’t miss it – I had more than enough to keep me entertained. Enjoying the fully lie-flat bed in pajamas provided by Korean Air. Flying doesn’t get any easier or more comfortable than this. I was very lucky (and grateful) to experience this! 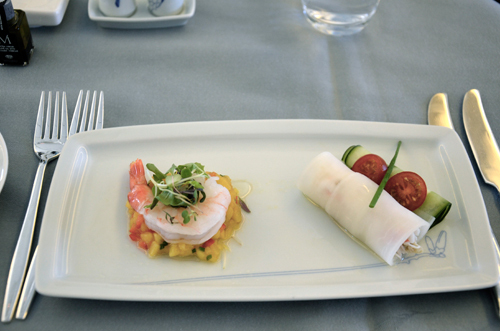 The food took airplane food to new heights. I realize I was flying first class, so of course it was good, and unfortunately, I can’t comment on what the food in economy was like. But the first class menu really was first class. From traditional Korean dishes like ‘Bibimbap’ to grilled beef tenderloin and roasted black cod, the food was gourmet. Although my favourite dish might have been the spicy Ramen noodles that were served as a snack later on in the flight. And the still-warm cookies. Lunch begins with blue crab meat cannelloni with poached prawn on mango salsa. 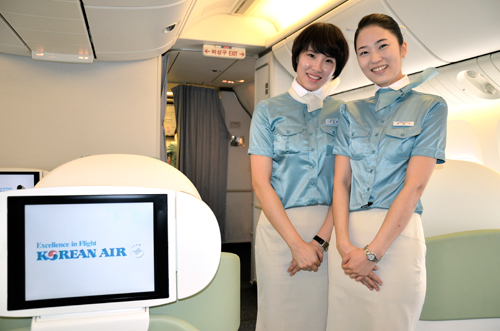 Overall, I give my experience on Korean Air a 10 out of 10. The service was exceptional. The flight attendants couldn’t have been more helpful or friendly. These days, when all we seem to hear about in the news are travel nightmares, it’s nice to know that there’s still exceptional service out there. Thanks, Korean Air! The incredibly friendly, polite and helpful flight attendants are a big part of the reason why the experience on Korean Air is so enjoyable. What’s your favourite airline to fly? « sorry for the silence … I was busy planning my wedding! Now, that’s the way to begin a honeymoon in style! Looks incredible and I’d love flying if I could fly like that. Can’t wait to read more about the multi-destination honeymoon! That looks amazing! I’ve heard wonderful things about flying Korean Air. Alas, 99% of my flight experiences have been 45 minute “up and downs” to La Guardia, being stuck next to men reading “indecent” magazines; I live vicariously through you.